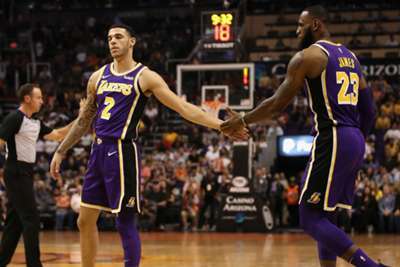 LeBron James and Lonzo Ball achieved something not seen at the Los Angeles Lakers since Magic Johnson and Kareem Abdul-Jabbar were gracing the court. James and Ball became the first Lakers team-mates since 1982 to tally triple-doubles in the same NBA game as Los Angeles defeated the Charlotte Hornets 128-100. Lakers superstar and four-time MVP James had 24 points, 12 rebounds and 11 assists for his 75th career triple-double, while Ball tallied 16 points, 10 assists and 10 rebounds to go with five steals. The last Lakers to accomplish the feat? It was Johnson (26/16/12) and Kareem Abdul-Jabbar (19/10/10). James and Ball are the first team-mates to each register triple-doubles in the same game since Jason Kidd and Vince Carter in 2007.